3 + six = Required Please enter the correct value. The West Texas Intermediate (WTI) crude oil price skyrocketed to a three-week high today (Monday) thanks to a new oil market report from the International Energy Agency (IEA) and the declining U.S. rig count. At 10:30 a.m., the WTI crude oil price surged 7.12% to trade at $31.75 a barrel. Futures for March delivery are on track to close at their highest level since Feb. 3. The U.S. benchmark is now down 5.6% this month and 16.8% this year. The Brent crude oil price also jumped higher today. The global benchmark – priced in London – was up 5.4% to $35.45 a barrel. Futures for May delivery have fallen 3.7% in February and 10% in 2016. But despite today's gains, the WTI crude oil price today is still trading at an artificially low level. In fact, Money Morning Global Energy Strategist Dr. Kent Moors – a 40-year veteran of the oil industry and high-ranking advisor to U.S. and Russian governments – says there's one kind of Wall Street institution responsible for manipulating the price of oil for their own benefit. The massive gains in the WTI crude oil price today came after the IEA predicted U.S. oil output will shrink by 600,000 barrels a day this year. The agency also said domestic production will decline by another 200,000 barrels in 2017. This bullish outlook renewed investors' hopes that the global oil market will stabilize in the medium term. Another boon for prices today is last week's Baker Hughes Inc. (NYSE: BHI) rig count. The oil field services company said the number of active U.S. rigs for the week ended Feb. 12 fell by 28 to 413. That marked the lowest level since December 2009 and the ninth straight weekly decline. At its peak in October 2014, the U.S. rig count hit 1,609. Although the WTI crude oil price is rallying today, it still remains at its lowest level since the recession. That's because the widespread panic over excess global supply and weakening Chinese demand have caused an artificial decline in oil prices this year. The real price of crude oil in the United States trades at a $12 premium to today's oil quote. That effectively puts it just under $44 a barrel. You see, the artificial "discount" we see in today's $31.75 oil price is caused by the short bets of hedge funds. According to Bloomberg, hedge funds increased their number of short positions by 15% in the second week of January alone. The shorts from these highly visible investors scare retail investors into thinking slowing growth in the U.S. and Chinese economies is dragging down the price of oil. The ensuing panic and sell-off hands these hedge funds easy profit. "Suppose 'Chicken Little' from 'The Sky Is Falling Hedge Fund' comes on screen and talks about oil moving down to $18 a barrel (or even lower)," Moors said earlier this month. "The hedge fund is already running short positions on crude that will profit if anybody watching the interview buys the 'panic.'" But Moors was able to see through all the panic and calculate the real WTI crude oil price. He has developed his own algorithm for determining the true price of oil by drawing on his 40 years of experience working with several powerful oil nations. "I've set up an algorithm to track these artificial oil price machinations," Moors told Money Morning readers on Feb. 4. "That algorithm is now saying that the premium for these moves now averages $12 a barrel." "In other words, oil quoted at $30 has an actual market value of about $42." 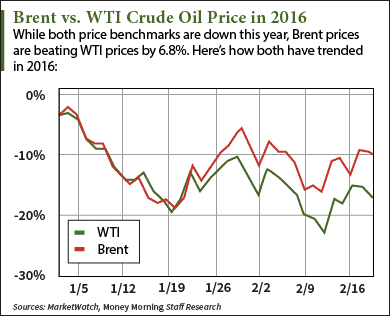 Although oil prices are artificially deflated, they're in for a long-term rebound in 2016. In fact, the 1.2% increase in annual demand this year will cause the WTI crude oil price to reach $70 by 2017. This slow and steady lift will offer us a number of profit opportunities along the way. But finding strong oil investments is no cakewalk. You have to carefully determine which oil stocks are dangerous and which ones are profitable during this volatile price environment. Alex McGuire is an associate editor for Money Morning who writes about energy. Follow him on Twitter for all of the biggest oil and gas updates.